Bah, no cookies for me. I had plenty of cookies in the last few months, from Japanese ginger and peanut cookies at Tink Hol market in Cleveland to giant West Point Market chocolate chip and ginger cookies at my monthly writer’s group meetings thanks to the thin and sadistic Ann. So in a case of extremely bad timing, I am following a high-protein, low-carb eating plan during the holidays. I can eat caviar, prime rib and shrimp out the kazoo, so I don’t feel too bad. But I cannot make even one batch of cookies for a photo for this newsletter because I would gobble them all up. I can dream, though. This week I’m dreaming of the dozens of cookies I plowed through in my career, in our frequent holiday cookie contests. If I could bake a few batches of holiday cookies, I would make the delicate Almond Cremes sandwich cookies that won the Beacon Journal’s 2002 contest; the sophisticated, chocolate-tipped Mocha Viennese Shortbread cookies from the 1998 contest, and my long-time favorite, Jam Poppits from the 1980 contest, before I was food editor. What a cookie tray that would be. The cookies are not quick and easy to make. They are fancy cookies, meant for a special occasion. They are cookies you may make just one time a year, and that time is now. Place flour in a medium bowl. Cut chilled butter into small pieces. Cut into flour with a pastry blender until crumbs are the size of small peas. Reserve 1 tablespoon half-and-half for use in the filling. Sprinkle one of the remaining tablespoons over part of the flour mixture and toss with a fork to moisten. Sprinkle another tablespoon over more of the flour mixture and toss with a fork. Sprinkle the last half-tablespoon over the flour mixture and toss to moisten. Gather dough into a ball. Do not knead or handle the dough more than necessary. Divide dough in half. On a lightly floured surface, roll out to slightly less than 1/8-inch thick. Cut into 1 1/2-inch squares. Dip one side of each dough square in confectioners’ sugar. Place a half-inch apart, sugared sides up, on ungreased cookie sheets. With a fork, prick each cookie in parallel rows. Bake at 375 degrees for 8 minutes, or until golden and puffy. Cool on wire racks. While pastry cools, make the almond filling by combining the 3/4 cup confectioners’ sugar, softened butter, almond extract and reserved 1 tablespoon half-and-half. Beat until smooth, adding liquid or sugar if necessary to achieve a thick spreading consistency. When the cookies are completely cool, sandwich in pairs with almond filling. Store at room temperature, loosely covered. Makes 2 1/2 dozen. In a medium bowl, cream 1 cup of the butter with the 1/2 cup sifted confectioners’ sugar and the vanilla until fluffy. In another bowl, stir together the flour and baking powder with a whisk until thoroughly mixed. Stir the flour mixture into the creamed mixture. Using a cookie press and a medium star No. 32 tip (or a pastry bag with a star tip, or a plastic bag with one tiny bit of a corner snipped off), make dough strips 3 inches long on an ungreased baking sheet. Place strips 1 inch apart. Bake about 7 minutes, or until very lightly browned around the edges. Cool. Meanwhile, mix remaining 2 tablespoons butter with the 2/3 cup unsifted confectioners’ sugar and the instant coffee mixture. Beat until creamy. When cookies are cool, spread a small amount on the flat side of one cookie and cover with the flat side of another cookie, making a sandwich. Repeat until all cookies are used. Melt coating chocolate or chocolate chips. Dip about one-half inch of both ends of each cookie in the chocolate, and place on a tray lined with waxed paper. Chill until chocolate is firm. Store in a tightly sealed container. Makes about 2 dozen cookies. Cut butter into flour with pastry blender until completely mixed. With a fork, stir in sour cream until thoroughly blended. Divide dough into 2 equal parts. Wrap each and refrigerate eight hours or overnight. Roll each piece of pastry to 1/16-inch thickness on a well-floured cloth. Cut into 2-inch rounds. Refrigerate scraps before re-rolling. Cut a small hole in the center of half the rounds (the top of an old-fashioned salt shaker works well). Place rounds without holes on ungreased baking sheets. Combine sugar and water and stir well. Dip out some of the sugar water with a fingertip, and moisten the edges of each pastry round. Top plain rounds with cut-out rounds. Moisten top with sugar water. Fill hole in center with about a half-teaspoon of jam. Bake at 350 degrees for 20 to 25 minutes. Makes about 40 cookies. Today I’m sharing a recipe for a festive peppermint-chocolate cheesecake I developed for my almost-book. I learned that when making cheesecake in the microwave, you must not cook it until it looks done. If you do, it will be rock-hard when it sets up. Instead, cook it until the edges are set but the center is still very liquid. You’ll have to be patient while the cheesecake cools, but the reward is a creamy cheesecake that tastes oven-made. Red-striped peppermint lozenges or candy canes tint this batter a fun pink. The combination of cool mint and dark chocolate rocks. Place cold cream cheese in a 12-ounce pottery mug and microwave on high power for 10 to 20 seconds or until cheese is warm on the edges but still cool in the center. Beat with a fork until smooth. Stir in candy and distribute evenly. Add egg white, sugar, vanilla and peppermint extract. Beat until the egg white is thoroughly incorporated, about 50 strokes. Use a spoon or small rubber spatula to scrape any unmixed ingredients from bottom of mug, and stir them in. Add flour and salt and beat until smooth. Stir in chocolate chips. Microwave at 50 percent power for 2 minutes, 45 seconds in a 1000-watt oven or 2 minutes in an 1100- or 1200-watt oven. The cheesecake is done when the edges are set and the top is covered with tiny bubbles but the center is still very wet. It will firm up as it cools. Place in freezer for 15 minutes for soft-set or in refrigerator until cool and firm. Dress it up: Drizzle one tablespoon of warm fudge sauce over the top of the cheesecake. Even better: Scatter a half-teaspoon of coarsely crushed peppermint hard candy over the warm fudge sauce or, at holiday time, a whole miniature candy cane. Grill-smoked turkey, pureed cauliflower, baked Japanese sweet potato; 1 turkey and cranberry sauce sandwich; pan-grilled strip steaks with wine sauce; chopped lettuce and turkey salad; turkey soup. Wendy’s chili; fried fish and watery steamed carrots at Alexandri’s in Wadsworth; brined and bacon-wrapped roast turkey, pecan-apricot cranberry sauce, creamy green beans, whipped sweet potatoes with candied pecan topping, 3 kinds of stuffing, mashed potatoes with incredible gravy, pumpkin and pecan pies and a Coppola claret at my niece Heidi’s in Columbus. She takes after me. (In response to the item about off-price cookbooks) The Library Shop at Main (in downtown Akron) always has a couple shelves of used cookbooks for about $2 each. I thought the old cookbooks got snapped up as soon as they were shelved. Thanks for letting us know there are plenty to browse. Second-hand shops are also good sources of used cookbooks. I’ve bought a few myself. Although panna cotta is on the menu of many fancy restaurants, in truth it’s easier to make than instant pudding. Seriously. That’s why I made pumpkin panna cotta Sunday when Tony and I craved something sweet. I knew I would be cooking pumpkin pie, turkey and other feast foods in the coming days, and I didn’t want to mess around. The simple Italian dessert has been described as “creamy gelatin,” but I think panna cotta tastes more like a firm custard. The gelatin in the recipe almost inconspicuously holds the milk, cream and flavorings together in a gentle embrace. I have seen panna cottas chilled in molds that are then dipped in warm water and tipped onto dessert plates. That’s not a good idea with a generously spiced version such as pumpkin. I found that some of the spices invariably sink to the bottom, which then becomes the speckled top when the panna cotta is unmolded. I recommend chilling and serving it simply in custard cups or dessert coupes (little footed dishes). To make the dessert super fast, I used pumpkin pie filling that is pre-sweetened and pre-spiced. I’m not ashamed. Consider the work involved in this recipe: a packet of gelatin is sprinkled on some milk in a saucepan and let stand for five minutes. More milk along with cream and pumpkin pie filling are stirred in and brought almost to a simmer. The mixture is poured into custard cups and chilled. That’s it. 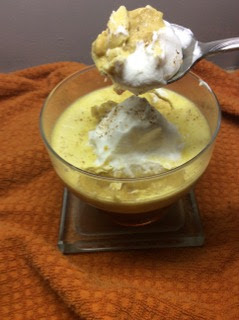 When Tony raved about my pumpkin panna cotta and I smiled and accepted his accolades as if I’d spent the afternoon in the kitchen — now, THAT I’m ashamed of. Pour 1/2 cup of the milk into a medium saucepan and sprinkle gelatin over the milk. Let stand for 5 minutes to soften. Meanwhile, whisk remaining milk with the cream and pie filling until very smooth. Pour into pan with gelatin, whisking well. Heat to just below a simmer, stirring until the gelatin dissolves. Whisk again and pour into 6 to 8 custard cups or coupes. Chill at least 4 hours. Top each with a spoonful of whipped cream and a dusting of grated nutmeg. Makes 6 to 8 servings. On Tuesday I cooked my annual pre-Thanksgiving back-up turkey my favorite way, on a covered Weber grill. Grill-smoked turkey is hands-down the best way to cook the beast. The meat always turns out juicy, smoky and delicious. One year I roasted a turkey in the oven and one on the grill and compared. The winner by a mile was the grilled turkey. I have to look up the directions every year because my brain does not hold onto every little detail. I assume you are the same way, so I am providing detailed directions I wrote years ago for the Beacon Journal. It is as good a guide as I’ve seen. You may want to print and save it. You’ll need a covered grill large enough to contain the turkey. If you’ve already put away your grill for the winter, don’t forget to open the vents or the fire will go out during the first half-hour of cooking. You’ll have to start over, beginning with moving the hot, slippery turkey to a platter. Use plenty of charcoal. The colder and windier the day, the more you’ll need. Pile about 50 or so briquettes in the grill for starters, and allow them to become about 80 percent ashed over. When the fire is ready, push the briquettes to each side of the grill and place a drip pan in the center of the grill. A throw-away foil pan works fine. The turkey will be placed directly on the oiled grill (breast-side up) above the drip pan, so that the juices for gravy flow into the pan, and so that no coals are directly under the turkey. This is called cooking with indirect heat and it’s what all true barbecuers do, whether the meat is turkey, pork or beef. If you place coals directly under a large piece of meat such as a turkey, the outside will burn before the inside cooks. Add two or three hickory chunks that you’ve soaked in water to the fire before putting on the turkey. This will give the meat a pleasant, woodsy flavor. Four or five briquettes must be added to each side of the fire about every 45 minutes, so that a steady heat is maintained. About halfway through the cooking, add a couple more chunks of hickory, too. Try to keep the two fires evenly hot, or one side of the turkey will cook faster than the other. Open the grill lid as little as possible, to keep the heat in. Other than rubbing the turkey all over with butter or margarine before putting it on the grill (to keep the skin from splitting), no basting is required. Either place a meat thermometer in the thickest part of the thigh (not touching the bone) before you begin grilling, or use an instant meat thermometer to determine doneness. The turkey is done when the thigh meat is 180 degrees and the breast meat about 170 degrees. The unstuffed 12 1/2-pounder I tested took about 3 1/2 hours to cook. A bone-in, 5-pound breast took about 2 1/2 hours. Cooking time will depend on how cold it is outside, the bone configuration of the turkey, and the temperature of the meat when it was put on the grill. When I grilled, it was sunny and about 65 degrees. But generally, figure on about 11 to 15 minutes of cooking time per pound — longer if it’s cold and windy. Rely on a thermometer, not looks, to determine doneness. The meat will be pink just beneath the skin because of the smoke, but this is not an indication of rawness. When the bird is done, transfer it to a platter, cover with foil and let rest about 20 minutes to allow the juices to return to the surface. Remove the drip pan and make gravy from the juices. That’s it. Just don’t expect any leftovers. Grilled turkey has a way of getting gobbled up. Turkeys may be cooked on gas grills, too. Just follow the manufacturer’s instructions for preparing the fire. Set the temperature control for 300 to 350 degrees, or low heat, and preheat 15 to 20 minutes, recommends the National Turkey Federation. Place the whole turkey on the grill and close the cover. Tony and I both are crushing on Xinji Noodle Bar in Ohio City, which we visited after thoroughly enjoying the Jazz Age exhibit at the Cleveland Museum of Art. Finally, ramen that tastes like the rich soup we enjoy in Japan. The restaurant, which opened in July, is hipster chic on a budget. It is sparsely furnished, with blond wood floors, high ceilings and the requisite exposed duct work. It is a large space — maybe carved from two former shops — partially separated by a wall of exposed brick. The menu is limited to ramen in several styles, bao sandwiches, a couple of rice bowls and a few appetizers. The latter includes two spicy, very crisp Korean chicken thighs that Tony and I shared. They aren’t as addictive as Nashville hot chicken, but close. The ramen portions are about half the size of the behemoth bowls served in Sapporo noodle shops, but my bowl of miso ramen was more than enough for me. The rich broth bespoke long-simmered pork bones. The curly ramen noodles had that mysterious crispness of real Japanese ramen (the unusual texture comes from the way the noodles are processed). To cap it all off, nothing on Xinji’s menu is more than $12. For hours and more information, go toxinjinoodle.com. Thick, pan-grilled lamb chops with herbs de Provence and wine sauce, roasted Brussels sprouts with bacon; pumpkin panna cotta; chicken and cabbage soup. Pad Thai at the cafe at State Road Giant Eagle in Cuyahoga Falls; Japan-worthy miso ramen noodles with corn kernels, kale, sliced pork and a few bean sprouts at Xinji Noodle Bar in Cleveland; pineapple and ham pizza from Rizzi’s in Copley; eggs over easy, grits, ham and a piece of toast at Wally Waffle in Akron; a cup of turkey chili and a Greek salad at Panera. I saw that you had food at the Eye Opener and had French dressing (which I love). How does it compare to Papa Joe’s White French? The reason for this email is I tried to make white French and it separated. I guess I didn’t drizzle the oil. Do you have a recipe for white French dressing? Place mayonnaise in a bowl. Grate the onion on the grater disk of a food processor or the large holes of a box grater, then mince finely by hand. Measure onion, packing down. Add to mayonnaise. Add remaining ingredients and stir well. Cover and refrigerate overnight before using. Makes about 1 cup. My cookbook collection is growing again after an abrupt halt when I retired from the Beacon Journal. I had access at the newspaper to almost every new cookbook printed in the United States. They arrived on my desk in droves, unbidden. I could look up an Uzbekistan dish, no problem, or decide which of five Peruvian cookbooks I wanted to keep. Ah, well. After an 11-year dry spell, I’m just glad to have a way to purchase a few of last season’s cookbooks for $2 to $3. Sometimes the books are older than last season, but that’s OK; they are new to me. There are probably lots of off-price book e-tailers, but BookBub is the one that snagged me. While it does not specialize in cookbooks, at least two or three are among the offerings in any given week. New subscribers check categories of books they are interested in, and receive daily emails with five or six book synopses. The prices are good for a limited time, and only through BookBub. Most of the books are sold at regular prices at outlets such as Amazon. So far I have bought Carnivore by Michael Symon, Pastries from the La Brea Bakery by Nancy Silverton, The Essential New York Times Cookbook by Amanda Hesser and The Best Recipes in the World by Mark Bittman. The latter two are the only ones that have tempted me to cook from them, but for $9 total, I can handle a few misses. I didn’t think I would like cooking from an electronic book, but now I enjoy propping my iPad on the kitchen counter and following along. When the food is finished, my iPad is right there to photograph it. 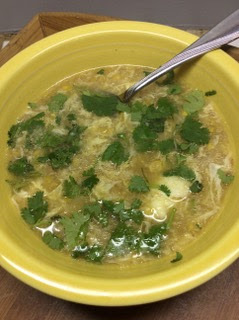 My latest electronic cookbook session involved a Chinese crab and corn soup from Bittman’s book. I chose it because it sounded so quick to prepare. It was, and Tony loved it. I liked it too, and probably would like it even more with homemade chicken stock and creamed corn that starts with fresh corn on the cob, which Bittman suggests as options. But then, the soup would never have made it to my table. This soup is delicate and lovely. The clean, grassy bite of cilantro juxtaposed against the creamy broth is what makes the soup, in my opinion. Is it one of the best recipes in the world? No, but it’s good and it’s quick, and worth the $2 paid for the book. Heat the oil in a large saucepan over medium heat. Add the garlic and shallots and cook, stirring occasionally, until softened, 3 to 5 minutes. Add the chicken stock and bring to a boil; then add the crabmeat. Lower the heat to medium and cook for about 2 minutes, until nearly done. Stir in the nam pla, wine, and corn. While stirring, pour in the eggs in a slow stream so they cook in thin strands. Garnish with cilantro and serve immediately. Makes 4 servings. From The Best Recipes in the World by Mark Bittman. Confession: I rarely buy unsalted butter. I know salted butter is not trendy, but I like the flavor. Now I can come out of the closet. Yes, salt originally was added to butter to help preserve it before the availability of reliable refrigeration, but it was added for flavor, too. The two types may be used interchangeably in recipes without compensating for the small amount of salt added or lost, Lebovitz says. Chinese corn and crab soup, French dip; bratwurst with sweet and sour cabbage; Japanese venison curry. Taco Bell tacos; butternut squash soup and grilled chicken salad with white French dressing at The Eye Opener in the Wallhaven area of Akron; eggs, bacon, grits and a biscuit at Cracker Barrel; and a Greek smorgasbord (pastitsio balls, spit-roasted lamb, marinated, grilled chicken, Greek cookies, rice pudding, etc., etc.) as a judge at a Men Who Cook fund-raiser at the Annunciation Greek Orthodox Church in Akron. I love your “ode to friends” issue (last week) so much. I’m an Akron girl who moved away and moved back, but I left my two dearest girlfriends a hundred miles away in Powell, Ohio, and this holiday season is when I miss them most. Recipes and stories are some of the best glue to keep us together. Thanks for the toast to the family we choose! Love (to Kate and Deena). Dear Rachel: I hope your Kate and Deena continue to enrich your life as Elizabeth does mine. Thanks for the note. At a dull dinner once I eyed the people at my table and zeroed in on two elderly women who had arrived together. They had been friends for decades, one confided. “What is the craziest thing you two have done together?” I asked. The conversation took off. Our table became so rowdy we drew glances of envy from around the room. If you’re very lucky you have an old friend like that — one who is part of so many memories she’s like your other self. For me it’s Elizabeth, my friend of 45-plus years. She was there when my first husband tried to strangle me. I was there when she graduated from college. We took up Tchaikovsky. We memorized “The Love Song of J. Alfred Prufrock.” We were there for each other when our careers started and when we retired, and every hilarious moment in between. Elizabeth also colluded in my early cooking experiments. She was up for whatever I wanted to try, including a recipe once that began with a panful of frying hot peppers that assaulted our sinuses and cleared the house. Then I moved away and became a food writer, and she whittled her weight down to 100 pounds and ate health food. But when we got together, she still gamely tried whatever I cooked. Last week it was Moroccan chicken with olives. She ate half a serving with basmati rice and a cold, spicy carrot salad. For someone who weighs 100 pounds, that was a lot. Four decades in, I’m still experimenting and Elizabeth is still trying it. If you are lucky enough to have a such a friend, share this soulful stew. To brine the chicken, combine the salt, sugar, and 1 cup hot water in a large bowl and stir until the sugar is dissolved. Add 3 cups cold water and the chicken pieces. Cover and refrigerate for 2 hours. Drain, rinse, and drain again. Arrange the onions in a large casserole (or pan) and top with the chicken pieces. Sprinkle with the ginger, turmeric, cumin, paprika, garlic, and cilantro. Pour the chicken broth over all. Bring to a boil over high heat, then reduce the heat to medium-low, cover, and simmer for 30 minutes, turning once. Meanwhile, combine the olives with several cups of water in a small saucepan and bring to a boil. Boil for 2 minutes, then drain well and set aside. Add the olives and lemon juice to the chicken and simmer, uncovered, for 10 minutes. If desired, simmer longer to reduce and thicken the sauce. Serve. Makes 4 servings. From The Essential New York Times Cookbook: Classic Recipes for a New Century, Amanda Hesser, editor. Put the carrots in a saucepan with water to cover and bring to a boil; reduce the heat and simmer for 8 to 12 minutes, until the carrots are tender but slightly firm. Drain the carrots and put in a bowl. Add the lemon juice and mix well. 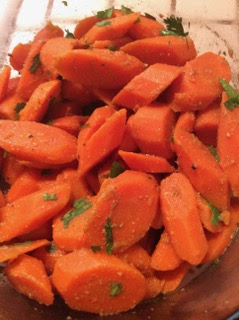 Combine the cumin, coriander, sugar, and salt in a small dish, mix, and then add to the carrots. Toss well. Season with pepper, and fold in the olive oil and cilantro. Cover and allow to marinate for at least 6 hours before serving. Makes 4 servings. Don’t believe the warnings that basmati rice cannot be cooked in a rice cooker. You have to make a few accommodations to make sure the rice turns out fluffy and with separated grains, but it can be done. Before cooking, rinse the rice very well to remove some of the starch. Do this by placing the rice in your rice cooker or Instant Pot insert, covering with cold water, swishing with your fingers for about 30 seconds. Drain. Repeat four or five times instead of the usual three times for regular rice. Cover with cold water again and soak for 30 minutes. Drain, then add 1 1/2 cups cold water for each cup of rice. Cook as usual in the rice cooker or Instant Pot. 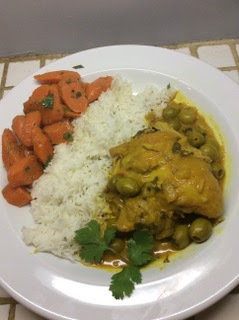 Moroccan chicken smothered with olives, Moroccan carrot salad, basmati rice. New York-style thin pizza from White Box Pizzeria in Wadsworth; a ham sub from Subway; a Spanish omelet, grits and toast at Alexandri’s in Wadsworth; marinated, grilled chicken strips with lettuce, feta and tomatoes on pita bread at Village Garden in Cuyahoga Falls. Note: I cleaned house (one-armed because of the shoulder surgery) in preparation for company last week and didn’t have time to cook, nor did I want to get my sparkling stove dirty. Tony couldn’t help because he threw his back out, but he did contribute thousands of empty calories. He discovered a motherlode of sugar-free baked goods at the Walmart in Wadsworth and lugged home blueberry and apple pies, lemon pound cake, chocolate chip and oatmeal raisin cookies, and banana nut and blueberry muffins. Arrgh. Have you ever heard of an evil practice called “threading?” If you use gmail as I do, you probably have fallen victim to this feature that combines all emails on the same subject into a single humongous email. I learned this week that if you delete an email in the “trash” folder, it will also delete all emails in the inbox that have the same word in the subject line. Anyway, that’s why I don’t have Mailbag this week. If you sent an email last week that I have not printed or responded to, please send it again. And if anyone knows how to turn off the evil “thread” function on a MacBook Air, please let me know. Yes, pork again. In the space of a week I made carnitas, breaded and pounded pork cutlets and pan-grilled pork chops. 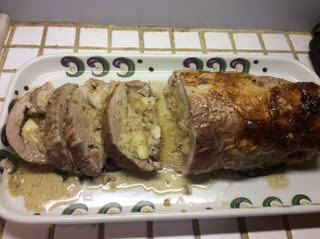 Now I’m sharing a recipe I developed last week for a spectacular rolled pork loin stuffed with cornbread and apples in a cider cream sauce. The pork fest has been delicious but I’ll lay off now that I’ve whittled my whole pork loin down to nothing. The thing must have been 3 feet long. I couldn’t freeze it because it had already been frozen once. For two years, every time I opened the basement freezer, it was a humongous, ungainly reminder that I had been too lazy to portion the meat before freezing. But that turned out for the best. Without that slight edge of desperation, I probably wouldn’t have combined apples, cornbread and cider in a dish that not only is delicious, but screams “fall.” This is the kind of entree you gather friends and family to share. It is a celebration. 1 boneless pork loin, 3 1/2 to 4 lbs. Place pork loin on a cutting board fat side down. Butterfly the pork loin by slitting lengthwise halfway through the thickness of the meat. Spread open along the slit. With knife blade flat against the meat, make a horizontal cut near the center slit, lengthwise through the thickest part of the meat on one side, stopping an inch from an outer long edge. Repeat on other side. Open meat by folding back along cuts. With a blunt meat pounder, pound meat to achieve a fairly even thickness. The meat doesn’t have to be thin, just evenly thick. You should now have a flat, oblong piece of meat. Season cut surface with salt and pepper. Melt oil and butter in a large, hot skillet. Add onion and apples, sage, 1 teaspoon salt and pepper to taste. Cook, stirring occasionally, until softened. Scrape into a large bowl. Add cornbread and stir well. Stir while drizzling in 3/4 cup of the cider. Evenly spread cornbread stuffing over cut side of pork loin. You may not need all of the stuffing. Press to condense stuffing. Starting at one long edge, roll pork cigar-fashion to encase stuffing. Tie at intervals with kitchen twine. Place stuffed pork loin in a baking or roasting pan with fairly low sides (a 9-by-14-inch pan works well). Pour remaining 1 cup cider around loin. Roast in a preheated, 325-degree oven for 1 1/2 to 2 hours or until an instant-read thermometer registers 155 degrees in the center of the meat. Remove from pan, cover loosely with foil and let rest 15 to 20 minutes before cutting into 3/4-inch slices. While meat rests, scoop any loose stuffing from the pan with a slotted spoon, leaving behind all of the cooking liquid. Place pan over a burner and bring to a simmer, scraping up browned bits from the bottom. Stir in cream and return to a simmer. Cook until liquid reduces slightly and flavors blend. Fan slices of meat on a platter or place a slice on each plate and top with a spoonful of sauce. Makes about 8 servings. This is the second installment from my almost-book of 5-minute cakes, custards, cheesecakes, bread puddings, pies and crisps. This flourless chocolate cake is one of my favorite recipes in the collection. “How soon can I get the recipe for this?” asked a friend who was persuaded to try just a bite before breakfast one morning and ended up eating the whole thing. The ultra-smooth texture and deep, dark flavor of this chocolate decadence-style cake is just about perfect. You could serve it at a dinner party with creme anglaise and chocolate curls and no one would believe it came from a microwave. Place chocolate and butter in a 12-ounce ceramic mug. Microwave on high power until butter is melted and chocolate is soft, 20 to 40 seconds. Stir until smooth. Chocolate retains its shape when melted in the microwave so stir very well before increasing cooking time. Add sugar and stir well. Add cornstarch, egg and salt and beat vigorously with a fork for 50 strokes or until the egg is completely incorporated. Microwave at 50 percent power for 2 1/2 minutes in a 1000-watt oven or 1 1/2 minutes in an 1100- or 1200-watt oven, adjusting the time up or down for lower or higher wattage ovens. The batter will rise and fall in the oven. The top of the cake will feel firm but look wet when done. Let stand a few minutes before eating. Any moist batter will set as the cake stands. If desired, immediately run a knife around edge of cake an invert onto a plate. Dress it up: Chill the cake and dust with sifted confectioners’ sugar. Even better: Garnish with fresh raspberries. NOTE: To make superfine sugar, process 1 cup of regular granulated sugar in a food processor for 30 seconds without stopping. Measure after processing. Locally made bratwurst and fried onions in Orlando brat rolls; sausage, potato and green chile soup; Japanese tonkatsu (breaded pork cutlets over rice with onions in a dashi-soy-based sauce), sugar-free strawberry Jell-O. One egg over easy, bacon and a biscuit at Bob Evans (Tony’s favorite restaurant); red pepper and mozzarella pizza at Pizza Fire in Montrose; corn and potato soup and a fabulous crispy kale salad with focaccia bread at The Courtyard Inn & Cafe in Lisbon; ribs and hush puppies from Old Carolina Barbecue in Fairlawn; baked crab and a Jane Roll (a California roll with caviar and both shrimp and crab) at Sushi Katsu in Akron. Dining at The Courtyard in Lisbon is like eating inside a jewel box. Surfaces are encrusted with tiny mirrors. Overhead lights glitter. The tabletops and the entire undulating bar are sheathed in gleaming copper. Interesting artwork surprises you around every corner. In most hands such a decor would be too much, but in the hands of internationally known jewelry designer Renee Lewis, the entire restaurant comes off as a work of art. Lewis noticed the old brick building — the oldest brick structure in Ohio — on trips to her hometown from Manhattan, where she lives now. It had been empty for years and was in danger of demolition. Lewis rescued it in grand fashion. She spent 11 years restoring the exterior as well as the interior, in the process fitting out four bedrooms for guests and installing a top-flight staff in the kitchen. Lewis chose a vegetarian menu so she would have someplace to eat on trips home, but the menu is so interesting and the dishes I tried so delicious that it should appeal to anyone. The lush crispy kale salad, for example, featured big pieces of oven-dried kale tossed with a mixture of greens, creamy strands of mozzarella and candied nuts. Dinner entrees are familiar, upscale items such as risotto, Thai peanut stir fry, and stuffed shells puttanesca over Sicilian olive-tomato stew. Ingredients are carefully and locally sourced, and everything including the breads is scratch-made. I can’t wait to return for another meal and to maybe one day stay in a room upstairs where three presidents, including Lincoln, have been guests. Information and directions are at thecourthouseinnandrestaurant.com. Reservations are recommended. I recently bought an Instant Pot and, like you, made carnitas as my first dish. Since then I have made a beef roast and a salsa chicken recipe, which was speedy because I had forgotten to thaw the chicken. Today I cooked artichokes in it. They were tender after 12 minutes and then resting while the pressure released for 10 minutes on its own, and then I manually released the pressure. I suggest watching some You Tube videos on the Instant Pot. I was afraid of pressure cookers for over 40 years thanks to the story involving a pressure cooker, potatoes, an explosion and third-degree burns told by my mom. I watched several videos — many very short — and they helped me to adequately understand so I could begin experimenting. I plan to make homemade yogurt in the near future. Going to try your pickled onions with carnitas for my next venture! Dear Michele: I’m excited to hear you can cook food from its frozen state in an Instant Pot. That would come in handy. Otherwise, I think I’d rather cook food the old-fashioned way. Re: Your pressure cooker article — how timely! I was looking at an Instant Pot last week. Many of my vegetarian and vegan friends are addicted. Thanks for the Melissa Clark reference article. Dear Linda: Go for it. Katherine’s recipe (below) would be a good place to start. Try the Instant Pot spaghetti from skinnytaste.com. It’s really delicious, and because of the pressure cooking, the whole wheat pasta better absorbs the sauce and it has a more pleasant consistency than usual. My whole family loves this recipe, and I’m going to make three batches in a row in a couple of weeks when I cook dinner for the homeless. Dear Katherine: Thanks for bringing this recipe to my attention. It sounds a lot like the classic Mexican homestyle dish, fideo, where broken pasta is stir-fried in a skillet to toast it, then stirred some more in sauce. The pressure cooker would eliminate the need for 20 minutes of stirring.